There are few areas of New York City odder than Roosevelt Island. It is closer to Manhattan and to Queens than either is to the other, and yet it feels like a world apart. And this is notwithstanding the fact that only a narrow avenue of water separates it from either borough, or that a bridge, a tramway and even a subway connect all three. And yet, unless you live on Roosevelt Island, you are rarely if ever likely to go there. Indeed, progress seems to happen on the island far more slowly than elsewhere in our five vibrant boroughs. Thus it is hardly surprising that it has taken more than 36 years for groundbreaking to occur, as it just has, at the southern tip of Roosevelt Island, in preparation for a monument to FDR designed by Louis Kahn shortly before his death in 1974. But there is an added irony as well as a cruel appropriateness to the delay. I wish to tread nimbly here because, as I have learned from past experience, the Roosevelt Islanders become quite touchy whenever an outsider, especially an architecture critic, appears to disparage their home turf. And yet, for better or worse, and not withstanding some new residential developments, Roosevelt Island remains mired conceptually and architecturally in the 1970s a decade which, you will recall, was not a happy one architecturally or otherwise for New York City. The predominant building stock was and remains one of brutalist poured concrete and those sharp angles that architects favored 40 years ago. That style appears to be what informs Kahn’s Roosevelt Memorial, and it is the same one that apparently will be executed, largely unchanged, at the 4.5-acre southern tip of the island: an abstract, simplified triangle, bordered by trees and culminating in a square platform that protrudes into the East River and contains a larger than life statue of the late president. Louis Kahn — at his best. He was capable of greatness and we should surely welcome anything by him in New York City. The problem is that, while some of his projects, like the Kimbell Museum in Fort Worth, Texas have thus far stood the test of time, others, like his two museums in New Haven, have not done so to the same degree. There is a real risk that the site will merely seem forbidding. On the other hand, more recent designers have not had more conspicuous success with projects like this: consider the new and overwrought FDR monument on the mall in Washington, DC. In any case, there is a certain logic that insists that monuments of this sort stand outside the normal course of city life. The problem with that logic, however, is that in a city like New York, such isolation encourages our citizens never to go there. When, honestly, was the last time you visited Grant’s Tomb or the Hall of Fame for Great Americans in the Bronx? On the other hand, the Augustus Saint-Gauden’s great monument to General Sherman, opposite the Plaza Hotel and the Pierre, is constantly flocked because of its urban centrality. 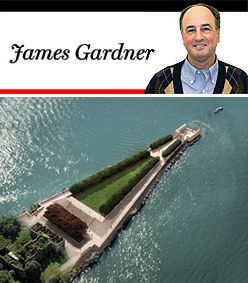 As for the upcoming FDR monument, I fear that, even if it is successful in every other respect, it will soon languish out there at the southern tip of Roosevelt Island.